Are you having a graduation party or a fun backyard BBQ? This is the perfect package for you! 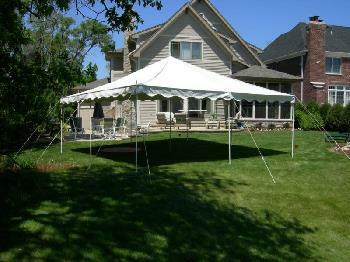 Our 20x20 party canopy tent package includes seven 8 foot banquet tables and 48 black folding chairs. 20 X 20 PARTY CANOPY (over the counter) no delivery or set up included in the pricing of OTC tents. * Please call us with any questions about our otc tent 20x20 party canopy package rentals in Columbia and Jefferson City MO.